You can’t fall in if you’re already in. This is the main thought running through my mind as I skulk along through freezing cold water at the base of How Stean gorge, clad in a wetsuit and desperately trying to avoid adding to the plumage of bruises I seem to be collecting. Gorge-scrambling is not a natural fit for someone who is terrified of slippery rocks and their tendency to cause nasty injuries, but I am determined to give it a go. Because this is by far the best way to see this beautiful gorge in Nidderdale on the edge of the Yorkshire Dales. This July the eyes of the world will focus on Yorkshire as it plays host to the Tour de France’s 'Grand Depart'. But there is so much more to this large and largely unspoilt county than can be seen on two wheels – and this limestone gorge some 1000 metres in length is one of the top attractions. The gorge has been a visitor attraction for more than a century but today the focus has shifted onto adventure activities – and so I found myself standing on a bridge 14 metres above the swirling waters about to abseil off. This, it turned out, was actually the easy part. Lowering myself down slowly and smoothly I landed feet first in freezing cold water within a minute or so. 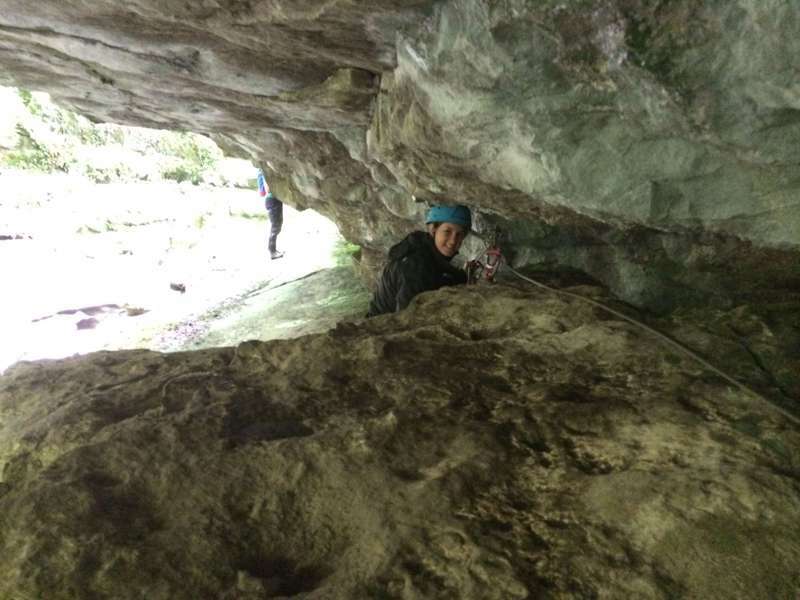 Our instructor Tony Liddy tells me we should have been praying for rain – water from the sky is far warmer than water from underground and after a while of no rain we are standing in pure cave water. With minutes I cannot feel my feet. But we must get used to it, because there’s a kilometre of gorge to explore. And so we jump straight in, literally, leaning backwards and keeping our bodies dead straight to flop into a deep pool back-first. After the shock of the impact and the cold wears off (slightly) we swim on, pulling ourselves over rocks and up ledges. We walk three abreast and scare the fish into swirling around us, and use our bodies to damn the flow between two rocks before letting it go, taking us with it down a natural rock slide. We spot frogs, water voles and spiders and point out the numerous tiny fossils in the limestone to each other. I do not fall in – and I soon forget that I was ever scared. Water always breaks a fall after all and Tony’s tip to stick to the green rocks and avoid the black algae-covered ones keeps me upright. My confidence increased, we turn to tackle our next challenge – the 'Via Ferrata', Italian for “iron road”, and in fact a set of steel cables attached to the rock to enable climbers to access places that would be impossible otherwise. It was the UK’s second Via Ferrata (the first is at Honister slate mine in the Lake District), but this year they have added an extension that really tests the mettle of those brave enough to try it. I am not feeling all that brave as we begin with what Tony calls an easy section. Running along a low rocky edge, this is to get us used to using carabiners and ropes and I am already struggling. Fortunately, there is plenty of room for error – you only ever undo one at a time so I am constantly attached. The first section involves a fairly straightforward balance beam across the gorge and a scramble between overhanging rocks, after which come the first of many metal hoops. I find it hard to trust these (or maybe it's myself); I cannot believe that one leg or one arm will reach far enough and find myself straining every muscle to fix my carabiners to the correct length of steel. Several times I clip myself to a metal loop in the rock by the extra short rope provided “just in case” and lean back onto it for a rest. This is where the Via Ferrata really comes into its own. Because I am clipped on, I am able to climb up the sheer rock walls and reach dizzy heights above the water below. I can get up into the trees and peer through the foliage at this beautiful landscape, all rushing water gushing over large rocks. This is also the only way to walk above the gorge itself and the new section zigzags across the water three times on a series of steel cables up to nine metres high. Although I am exhausted from the climb up to this point, I find this somewhat easier, my boots gripping better to the cable than they did to the rock and my head for heights finally finding its equilibrium as I gingerly make my way across holding on to the cable at head height. After two traverses of the gorge Tony makes his way past me and begins pulling on a yellow rope across the water above head height. This he tells me is a Tyrolean traverse and it will see us safely across the gorge for the final time. I am clipped in by my carabiners and sitting back on the ropes let the pulley system take me out across the gorge. When my momentum slows I reach out for the blue rope strung across from one rocky wall to the other and use this to pull myself along until I am able to stand up on the muddy bank that runs alongside the gorge. Finally, all fear is forgotten and I can sit back and enjoy the ride – and the beautiful Yorkshire scenery. How Stean Gorge in Nidderdale, North Yorkshire offers Via Ferrata and gorge-scrambling for £45 per person per activity. Alternatively book the “big five” for £95 and add caving, abseiling and canoeing, as well as lunch in the on-site café.